What is in your Prenatal Multivitamin? 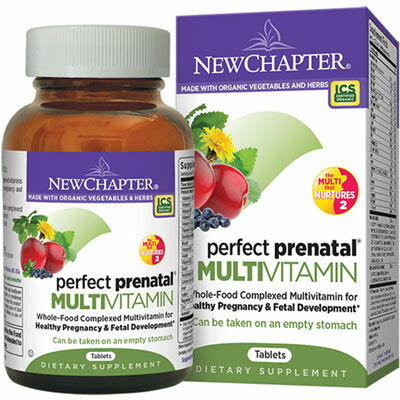 Home → Featured Products → What is in your Prenatal Multivitamin? What should you look for when deciding on your prenatal multivitamin? During pregnancy and even before, it’s common for women to support their nutritional needs by taking a daily prenatal multivitamin and mineral. There are different types of multivitamins available. Some are blends of synthetic, chemical isolates. Others, like New Chapter’s Perfect Prenatal™ take vitamins and minerals another step by fermenting them in a matrix of beneficial probiotics, fruits, and vegetables (no live probiotics are in this product). Fermenting or culturing ingredients with “good bacteria” to enrich them is actually a practice that goes back thousands of years. New Chapter brings this tradition of fermentation to Multi’s, transforming vitamins and minerals into dynamic networks of nutrients. In addition, Perfect Prenatal delivers targeted medicinal herbs, many of which are fermented, just like the vitamins and minerals. If you are pregnant or planning to be, Perfect Prenatal is formulated with your needs in mind. Every daily dose provides pregnancy-essential nutrients, including Vitamin D3 and Iron, and Folate to help reduce the risk of neural tube defects. In addition, Perfect Prenatal delivers organic medicinal herbs for the maintenance of good health, including Rose Hips, Prunes, and Broccoli. Perfect Prenatal’s once-per-meal formula of nutrients is easy to take and is suitable for vegetarians.